I have read enough of Ted Leeson to realise that it doesn’t pay to second guess him and Jerusalem Creek doesn’t disappoint in this respect – or any other that I can think of right now. It is, as far as I know, his third book: his first being the delightful The Habit of Rivers; and his second, a complete change of pace with the encyclopaedic Fly Tier’s Benchside Reference - two works which have about as little in common as it is possible for a writer to achieve within the confines of a single subject. The fact that Leeson can move so effortlessly from story telling to the technicalities of dubbing loops is a singularity, but what is ultimately most impressive is that both works are so remarkably good. 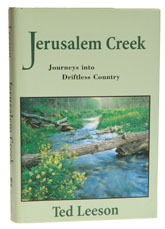 Jerusalem Creek is a collection of stories about doing nothing very much except fish and think in southwest Wisconsin. The emphasis is very much on the thinking, and if The Habit of Rivers was shot through with a vein of philosophy, Jerusalem Creek is mother lode. There is reflection here on just about everything from the meaning of life to plate tectonics, taking in hydrology and a few other branches of physical science on the way. That isn’t to say that there isn’t room for fishing (Leeson does everything from night crawlers to nymphs), and the text is beautifully written, but you want to be in the mood for a full-on intellectual challenge before you pour the whisky and settle down with this one. I enjoyed it.